Being a night person, I usually find time for taking pictures at dusk or night. Sunset, diffused or artificial lighting, candle-light or moonshine apply their charm and flair to the picture. However, how often have we failed in capturing the atmosphere with only the remaining light available? Lucile initiated the Photo101Rehab after the Photo101 Course in December 2014 for all photo enthusiasts to stay connected and to learn from each other. Meanwhile, it became a constant feature that continuously grows: Perelincolors is presenting Tech of the Month, Desleyjane from Musings of a frequent flying scientist is featuring the monthly Image Reboot. It’s a great pleasure for me (angleandviews) to join them in featuring this monthly series about Available Light. Each month, I will focus on one application or method of available light photography in detail. In all pictures, you will find the chosen camera settings in the caption. In this first post, I summarize some basics and invite you all to start playing with challenging light conditions. To get started, I decided to jump in at the deep end: I took pictures at the midsummer festivities in Spitz at the Danube, Wachau in Austria. 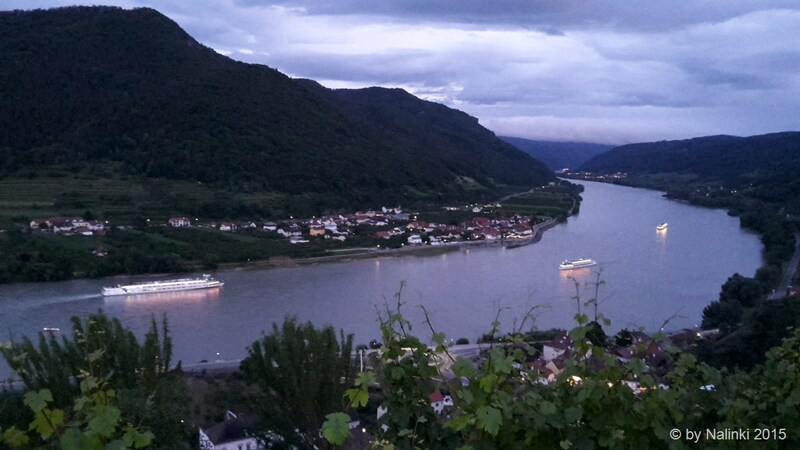 The Wachau region along the Danube is famous for its vine and vineyards. At midsummer, they have fires and fireworks to celebrate solstice. 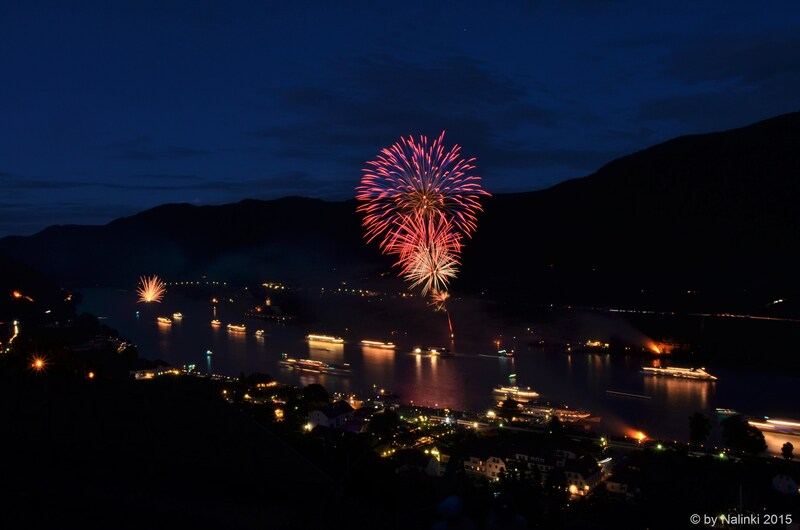 Lots of ships take tourists onto the water to enjoy the fireworks directly from the Danube. 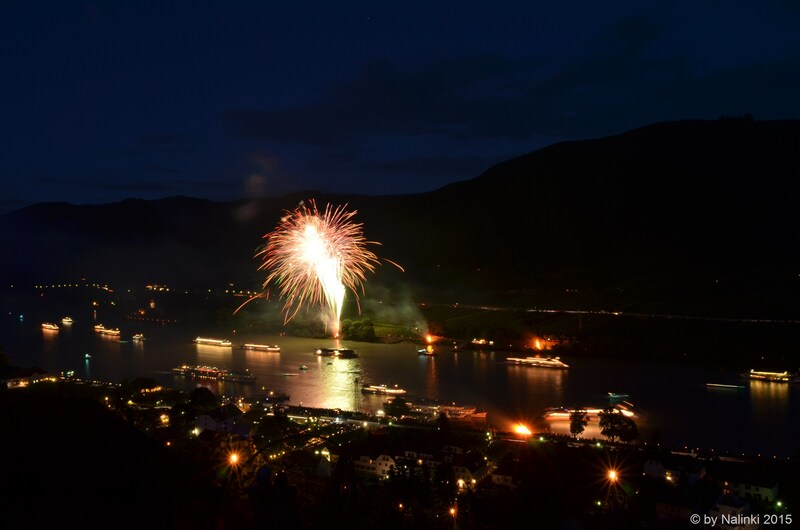 Others walk up the vineyards and watch the sparkling fireworks and lights of the ships mirroring in the water. This amazing setting of water, fireworks, lights and fires are ideal to play with the available light. As I was joining the event by chance and therefore was not prepared for low-light conditions, I had to work with what I had: my camera (Nikon D7000) with a Nikkor 20mm 1:2.8 and my Samsung Galaxy S5 Mini smartphone. Missing a tripod, I had to take the pictures hand-held or putting the camera on one of the pillars stabilizing the winding vine. This already implements an important point: If you lack equipment simply stay inventive. You’ll always find some stable spots to support long exposures. In general, always be creative: independent of which camera you use (DSLR, smartphone, compact camera), the picture is always composed by you! Choose some unusual perspectives, use nature’s structures, forms and lines. Don’t miss out the shadows, they might add an interesting effect or additional contrast to your picture. Using blur as a tool will lead the beholder’s eye to the spot in focus while the rest is framing it. 1) Aperture, exposure time and ISO need to be in the right balance: turning one wheel will always have a significant impact on the other. Beginning with twilight, you will have to make compromises. Try to get confident with the limitations and strengths of your camera. 2) Changing the aperture determines how much light travels to the sensor. An open aperture will lead to a shallow depth of field. Make sure to focus precisely that the important parts of the picture are sharp whereas the blurry parts seem diffuse on purpose. 3) The shutter speed defines for how long light may enter – short ones resulting in sharp pics, while longer ones lead to motion blur. For the fireworks, I have chosen around 10 seconds because the fireworks usually explode sequentially. With longer exposure times, you’ll increase the chance to catch more of them colorfully filling the sky in the picture. 4) The ISO is the indicator for light sensitivity. A higher ISO allows you to shoot at low-light conditions, but will increase the noise (unspecific random color in the picture). There are huge differences between cameras when shooting with high ISO values. I recommend to take several pictures with different ISO settings and compare the results on a big screen. If you know which maximum ISO you personally want to work with, you only need to balance aperture and shutter speed. 5) Different light sources have different temperature profiles. Taking pictures indoors with an artificial light source, outdoors in bright sunlight, or during a romantic candle-light dinner – the light will definitely influence the atmosphere of the picture. To capture the scenery realistically, you need to set the white balance accordingly. Most cameras have pre-defined settings for daylight, sunset/sunrise, cloudy skies that you can choose from. Alternatively, you can manually set the value in Kelvin. In these twilight pictures, I set the white balance manually to 4760K. Online you can find white balance – Kelvin charts listing the temperature ranges for different light conditions. 1) Start playing: try different shutter-speeds while taking pictures hand-held to get a feeling at which shutter-speed your picture will become shaky and wiggly. At which ISO does your camera still reach a low noise-level? Know the maximum aperture of your lens, and if possible choose a lens with a large maximum aperture to be able to capture as much light as possible whenever needed. 2) Never be afraid of darkness! If you like to join, link your post at Photo101Rehab or create a pingback and tag it with #availablelightrehab. I will add a wrap up with your entries at the end of the following topic. Next month, I’ll zoom in on light effects, stay tuned. Thank you for sharing this helpful information. I have been shooting photos with my IPad, IPhone and Canon point and shoot since completing Photo 101 course. Though, I gifted ME with a Nikon 5200 at Christmas, I have only taken a few shots from my back patio. Even after scanning through the book, “DSL 5200 for Dummies”, I still feel dumb. I hope connecting with Photo Rehab will build my confidence and help me transition from being an intimidated photo taker to a photographer with confidence. I added this post to my Reader as an educational resource. I’m glad you like it. enjoy your d5200, you cannot do anything wrong, just try it – if you don’t like it, you still can delete it easily. Muchas gracias por la información. Trataré de sacar de ella lo más posible, pero me pregunto si es posible ponerla en práctica con una cámara compacta. Wow, this is so helpful! I learned a lot! I know a little bit about ISO, aperture and shutter speed but often feel embarrassed to ask a photographer more about it! Thank you for a very clear and well-written piece that details the magic of the camera and what we as photographers put into it! Oh, the Northern Lights are a dream of mine to see! Thanks, I suppose I shouldn’t be embarrassed! Asking questions is how I’ll learn! Thanks again and have a lovely weekend! Night photography is fun. My favorite time to shoot. Excellent and informative post combined with fascinating photos, a lot to learn here! Lovely dusk and night photos. And you information about the technique is spot on.